3Built?s Remote Engine Shut-off Systems (RES) were developed to instantly cut the engine?s ignition system with the push of a button. Think of the RES as a remote controlled on-off switch. Allows you to monitor your child from as far as 250 feet away. 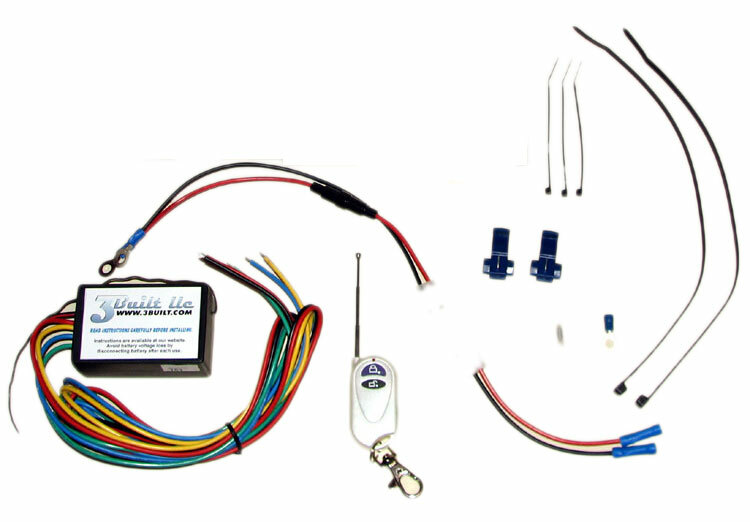 Can be installed on virtually any motorcycle, ATV, snow-mobile, go-cart, or generator. Pressing the UNLOCK button releases the relay and allows the vehicle to be restarted. The RES units do not restart the vehicle. Functions with Normally Open or Normally Closed type ignitions switches. Determine type while factory Off/Run is in RUN position. Each unit is individually coded so it will not affect another RES. Two or more RES units can be custom ordered to work on the same channel. RES units can also be used as a simple security system. In the LOCK state the vehicle cannot be restarted. We recommend disconnecting the power source to the RES by unplugging the included power connector to avoid draining the battery while not in use. Always TEST your batteries and RES operation before each use. Q: Will this kit work on a 24v system? My kids Power Wheels ATV is 24v.